SCHEDULE A B-52 RIDE TODAY! During the Strategic Air Command (SAC) Southeast Asian experience from 1966 through 1975, U-Tapao Royal Thai Navy Airfield was the primary launching platform for what they nicknamed "Arc Light" airstrikes within South Vietnam. On some occasions, strikes were also conducted within North Vietnam. Most of those missions were flown by the B-52 "D" model pictured here. U-Tapao also hosted numerous KC-135A tanker aircraft. These were normally used to refuel fighter planes stationed to ohter bases in southeast Asia. B-52s did not usually require refueling for "Arc Light" missions due to U-Tapao's proximity to targets in South Vietnam. This photo captures a moment in history. 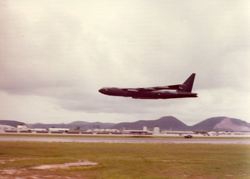 This was the last B-52 to leave U-Tapao.